SAM I Am Films, producers of “Scrooge & Marley,” a modern-day variation on Charles Dickens’ classic holiday story, “A Christmas Carol,” has posted the first trailer of the film, which will be released in December. 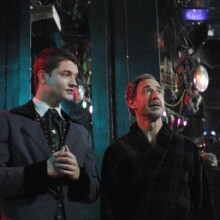 Acclaimed out actor David Pevsner portrays Ben Scrooge while former SNL star Tim Kazurinsky appears as the Ghost of Jacob Marley. The trailer kicks off a series of “Christmas in July” fundraising events that will include house parties, a cabaret benefit and an Indiegogo.com online pledge campaign—all designed to raise awareness and excitement about the film’s holiday release and to aid producers of the independent feature in securing additional post production funds. Posted July 13th, 2012 & filed under Entertainment, News.